Community Blog by lostleader // 60 game year challenge update 8: Why did this take me so long? Hello again Dtoid, I know its been a while. While I haven't been posting on here as nearly much as I should, I'm still giving it my all to beat 60 games in the matter of a year. While it certainly doesn't look like I'm close to reaching my goal here I am far more along my actual challenge, I just haven't written it up for ya. So without further stalling for time, I present games, 37,38, and 39. Boy is this game a call back to the NES era. If anything this game is more like a simulator for the �80s than a game. Just the world Retro Game Challenge creates is impressive, and that alone is worth a look into this game and makes my nostalgia tingle. There�s a memo system to write down codes that you get from in-game magazines, the magazines themselves feel like a literal blast from the past with news mock ups of delays and reviews. There is even gossip talk about released video games that you witness throughout the story. Just everything about this game makes me feel like it�s the good old days of gaming where things were creative and whimsical. Where the internet wasn�t around to damper your spirits about playing a game, and the only information you got was from magazines and kids that were lying. In other words, Retro Game Challenge lives up to the name retro. RGC also gives the player 8 retro games to play from, and 6 of which that can be defined as completely different games. All the games feel fully fleshed out for the time of their supposed release, and could have very well been old classics companies never released till now. The sounds, graphics, and gameplay are just so similar to retro games of old that it�s eerie sometimes. They also captured the harsh difficult of past games, along with plenty of cheat codes to make the game easier. The first game available at the start is called Cosmo Gate, and it�s a shooter that resembles the likes of Galaga. The game itself is pretty straight forward kill enemies, gain points. It�s not very noteworthy, but it certainly captures the past. The 2nd and 5th games available are Robot Ninja Haggle Man 1&2 respectively. Both appear to resemble arcade games like Flicky, and are about killing enemies and finding the door to move on to the next stage, with the 2nd going further by adding a boss at the end of the game. While it certainly is more fleshed out than Cosmo Gate and Rally King / SP it feels more generic, and is probably the weakest game(s) in this �retro collection�. Rally King, the 3rd RGC game, and its special edition: Rally King SP, the 6th RGC game, are the top down racing games of RGC and are similar to games like Pole Position. It�s a simple race to the finish and get first place, the only thing really noteworthy is that Rally King has drifting involved with its game mechanics, which is something I don�t remember having in most top down racers. While Rally King itself is good, the fact RGC adds another game that is pretty much exactly like it, but harder certainly feels like a rip off to the player. By far my favorite game though is Star Prince, the 4th game, as it feels like an awesome shmup that was lost in the early �90s. It�s a more fleshed out Cosmo Gate with a lot of cool power ups, backgrounds, and enemies, although the bosses are all pretty much the same. Star Prince honestly doesn�t have much going for it, but it charmed me in its way to pretty much duplicate any given arcade shmup you saw in theater arcades in the early �90s. The 7th game is actually a full blown RPG called Guardia Quest that requires constant grinding and actually has a decent story to it. Guardia Quest is actually pretty long too, about 10-15 hours give or take. The fact they were able to fit a whole RPG in RGC impressed me enough to say that Guardia Quest is probably the best in terms of quality, but my favorite in this collection still goes to Star Prince. The last game RGC offers is Robot Ninja Haggle Man 3, a sequel to the rather generic Haggle Man series of this collection; however this time it comes back as what seems to be a Ninja Gaiden inspired sequel. The game focuses on tricky platforming and grinding for power ups so you can become more powerful to kill your enemies. The game itself is alright, but with the lack of creative bosses and the odd leveling up system, RNHM3 ends up being rather barebones when it could have been something much more. Conclusion: Retro Game Challenge is a trip to the past in the most literal sense to gaming. Even if you�re not a fan of nostalgia, these games stand on their own merit, and deliver fun gameplay, while mimicking retro gaming to an eerie level. If you�re a fan of Retro Gaming this game is certainly a must. I love Okami just so very much. It gave me so much to go through within a game. The art style is amazing, the story is wonderful, the characters are awesome, the gameplay is nostalgic, inventive, clever, and basically Okami is just all kinds of awesome. Okamiden, however, is not so much like its predecessor. It�s heavily the same game as Okami is, but cuter and shorter. Chibitersu is adorable, and some of the newer characters are interesting, and for older characters it builds on them. But overall Okamiden feels a bit more like a side story within Okami, then an actual sequel to it. I know I�m making Okamiden out to be a bad follow up, but really it is quite ambitious in its endeavors, and following up Okami is no easy task. At the least Okamiden brings a few new things in to the mix, and the partner system is a good edition. Also the ability to use the stylus throughout the game makes game play much smoother than Okami ever could make it. The story itself is pretty interesting as well, especially when it starts to interact with the first story, but it also dampers playthroughs of Okami if the player played Okamiden first. This game is also plagued with a lot of tedious puzzle solving that just makes you question the game. Like why do I have to press 3 different switches when the action could have been completed with one switch? But it still has good puzzles in it, just too many filler puzzles that outweigh the good. Really though, Okamiden just never really captivated me enough to love it as much as I did with Okami, it just felt like it was simply building on what Okami did. I want to say Okamiden was a lazy game, but I don�t think that�s what it is. It just doesn�t offer enough to build itself as a sequel, but relies on Okami to succeed as a good game. And in that regard it works, and it works well. 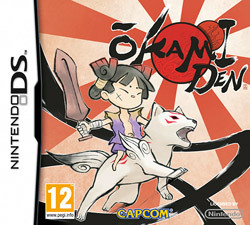 But as a standalone, Okamiden just doesn�t offer much to those that haven�t played the original. Conclusion: I can�t say Okamiden stands on its own, but when played after Okami, it�s a game that wets the appetite of those that wanted more from Okami. While a lot of the game is stuck in Okami�s shadow, it still offers exactly what Okami offered, and really that�s enough to give it a play. Also chibitersu is cute, so what�s not to love. I�m a bit ashamed to say that I never beat Legend of Zelda till today. Considering that I was a big fan of the series ever since one of my grade school friends introduced me with Link�s Awakening. But I can�t say the first Zelda really pulled me in either, while I did miss out during the NES era, I was given a chance to play it during the gamecube era, thanks to the collector�s edition. Zelda provided to be too hard for me, and because I had no idea where to go I decided to give up and move on to other games. The fact that it was just so wide open, and gave you no direction of where to go was just off putting to me. But when I got Zelda via the ambassador program, I decided to just go for it, for the sake of this challenge and my gaming honor. With me playing Zelda on a portable handheld, the help of a �save state�, and the internet, I was able to finally beat this game. Usually I�m against using the internet for helping me game, or at the least, ashamed of it, but Legend of Zelda is just too open ended to not ask for or seek help. There is just so much to this game, and the NES is only able to store so much information to tell you where to go or what to do. I may be a bit of an old hat in gaming, but I had a lot of trouble finding some of these dungeons. I also had to use the �save states� the 3DS gives you to beat this game. It still proved to be too hard for me not to. Just some of the enemies in this game, mainly wizarobes, give out so much damage for one attack that you are down like 10 hearts in a matter of seconds. And is it just me, or is the heart drop rate really small in dungeons? I swear I could kill 10 enemies, and get maybe 1 heart if I�m lucky. I really just don�t understand how kids younger than me had an easier time with this game, maybe we were just tougher back then? Games nowadays tend to hold our hands quite often too, so I guess I just got soft. But either way Zelda certainly is Nintendo hard in my book. I know I�m complaining a lot about it, like �ya, games back then were hard�, but in the end I did find Zelda to be quite an enjoyable game. In fact, I would say that it gets better with each play through. I mean despite my hang ups with my first playthrough I know I can go back to this game and play it differently than I did last time, and that excites me. I can�t exactly say that about other Zeldas, no matter what, I still have to beat all the dungeons as a kid first before I become an adult in Ocarina of Time, can�t exactly go to turtle rock right away in Link to the Past, nor can I get anywhere during the 2nd half without my horse in Majora�s Mask. I mean when was the last time you could say you beat the 3rd level before you beat the 1st? Sure Mega Man gives you that kind of option, in a way, but it�s not inside a full blown world. This type of exploring is really fun, and needs to be a little more present in video games. I mean everyone�s first playthrough of Zelda may not be exactly the same as others. No one person gets the exact same experience. As well when you are actually done with this game you can change your routes, were you go, what you do, etc. You can effectively make speed runs in any way you want, make challenges like the no sword run. The actual end to Zelda is just your imagination on how to play it, and I think that�s what makes it such a great game.